The history of the Crescent Hotel is the history of Eureka Springs. The reason both exist is because of the water. More than 60 springs, which bubbled up “healing water” in and around Eureka’s downtown area, were visited by thousands of tourists in the late 19th century. Midwest businessmen, many who were in the railroad business, saw an opportunity to cater to a high-end clientele as well as filling railroad seats. That opportunity: build a luxury hotel that would overlook the water-rich valley below. In 1884, the construction of that “opportunity” began. Carving and assembling 18-inch thick blocks of limestone from a White River quarry just 10 miles from the construction site was the job of Irish stonemasons. These artisans were brought over to the United States for the sole purpose of building the hotel, owned by the tycoon conglomerate known as The Eureka Springs Improvement Company headed up by Powell Clayton, who served as Governor of Arkansas, United States Senator, and U.S. Ambassador to Mexico. 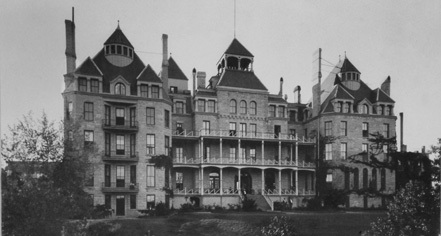 Following nearly two years of construction, The Crescent Hotel, named after the mountaintop upon which it sat, was completed. On May 20, 1886, the doors of this glamorous hotel swung open and a Grand Opening gala was held in what is now the Crystal Dining Room. Hundreds of gaily dressed guests danced across the hardwood floors to the strains of a live orchestra pausing only to sip on fine wine and nosh on such delectable treats as Crab Lorenzo, a dish still on the Crystal Dining Room’s menu today. One of the most prestigious guests at that opening was James G. Blaine, former U.S. Congressman, U.S. Senator, Secretary of State, and a candidate for president in 1884 losing in a close race to Grover Cleveland. Other dignitaries, accompanied by their highly festooned spouses, included State Supreme Court justices, United States federal magistrates and judges, Arkansas constitutional officers, and numerous high-ranking military men. Seizing on the ever-growing popularity of Eureka Springs’ “healing waters,” the hotel was purchased by the Frisco Railroad in 1905 to serve their customers while building train ridership, specifically from the Chicago and St. Louis areas. This proved successful for a few years. 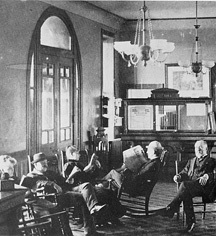 However, when annual off-seasons saw a decline in hotel occupancy, the hotel was opened to co-eds. In 1908, the Crescent College & Conservatory for Young Women opened for “fine young ladies” and those with athletic prowess born out by the frequent championship teams this small college put on the court. Due to tough economic times brought on by the Great Depression, the college closed in 1934 and the hotel only opened during the summer months. Three years later the Crescent’s doors reopened for an alternate use, marking one of the most colorful eras in the hotel’s history. In 1937, a charlatan who allowed himself to be called “doctor” purchased the Crescent Hotel and converted it to Baker’s Cancer Curing Hospital. People came from all over the country in a belief that Norman Baker and his mystical combination of fresh air, good food, exercise, and an elixir that consisted mainly of alcohol and watermelon by-products could cure them of their dreaded disease. Many came. Many were treated. Many died. And many are said to still roam the halls... but that’s another story. Baker’s female friend began running the building as a hotel in 1940, after Baker was arrested and sentenced to four years in Leavenworth Federal Prison. The hotel was sold to and renovated by Chicago businessmen in 1946. Despite having its entire roofline destroyed by an early morning fire in 1967, followed by numerous owners and financial hard times, the Crescent Hotel operated as a vacation, wedding, and honeymoon destination for the next nearly half-century. In 1997, “The Grand Ol’ Lady of The Ozarks” saw its true renaissance. It is said that since Marty and Elise Roenigk purchased the hotel on May 5, 1997 more positive change has taken place at The Crescent than ever before. The Roenigks dedicated themselves to restoring the 1886 grandeur of this 111-year-old hotel. This redevelopment has positioned the hotel in high national stature as it has been accepted as a proud member of Historic Hotels of America. The Roenigks' dedication has seen the addition of the New Moon Spa, Dr. Baker’s Bistro & Sky Bar, the East Lawn wedding venue, the Conservatory, Cottages At Crescent Park, Annex Suites, the development of the surrounding formal gardens, plus the near total renovation and upgrading of all sleeping rooms. In 2011, The 1886 Crescent Hotel & Spa celebrates its quasquicentennial (125th anniversary). It also marks 14 years of ever-flowing prosperity, apropos for a hotel that was built because of water. 1886 Crescent Hotel & Spa, a member of Historic Hotels of America since 2000, dates back to 1886. Read more about the history of 1886 Crescent Hotel & Spa, as told by Historic Hotels of America 2014 and 2015 Historian of the Year Stanley Turkel. Excerpt is taken from his latest book Built to Last: 100+ Year-Old Hotels East of the Mississippi (AuthorHouse 2013).